The strongest Bond chapter with Pierce Brosnan in the role, The World Is Not Enough benefits from locales that are gritty rather than glamorous, two suitably dangerous villains, and a plot that, within Bond's context, remains grounded and actually makes some sense. Directed by veteran Michael Apted, The World Is Not Enough features brisk but controlled pacing, rational editing and a complex, multi-faceted conspiracy. Sir Robert King, an oil tycoon and a friend of M (Judi Dench), is assassinated right inside the MI6 headquarters in London. Bond heads out to the oil fields of Central Asia to protect King's daughter Elektra (Sophie Marceau), who has inherited his empire and may be the next victim. Elektra had already survived a kidnapping masterminded by Soviet terrorist Menard (Robert Carlyle), but that does not stop her from becoming Bond's latest bed companion, although it's not clear in this case if he is the seducer or the seduced. Bond soon uncovers a Menard plot to steal a nuclear bomb with the intention of triggering an explosion that disrupts global oil supplies. As M gets personally involved, Elektra is revealed to be not all that she seems, and Bond needs to save his boss, eliminate two evil masterminds, and stop the destruction of a major oil pipeline node. The venturing of M into the danger zone, and her kidnapping as the drama unfolds, provides Judi Dench with her biggest role yet in a Bond movie. While this is welcome from the film's perspective, it is highly unlikely that the head of MI6 would ever get anywhere near as personally involved. 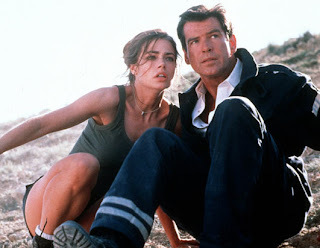 Denise Richards as Dr. Christmas Jones, a nuclear physicist who helps Bond, is unfortunate at so many levels. Richards as an actress is never more than eye candy, and stuffing her into tight shorts and mid-riff baring tank tops at every opportunity does nothing to dispel the theory that casting her in a ultra-brainy role was a joke that missed its target. The World Is Not Enough survives these less than perfect moments thanks to the unusual real-world intensity of the unfolding drama and the effective, seductive menace that Marceau brings to her role as Elektra King. Bond has rarely had to tangle with women as strategically powerful, evil, and conniving as Elektra, and she is a welcome upgrade compared to the interchangeable men that typically pull the strings of the nefarious plots. The World Is Not Enough is Bond at his best, one of the rare instances where the series pulls together its best elements, dumps most of the diversions, and delivers hard-nosed entertainment.